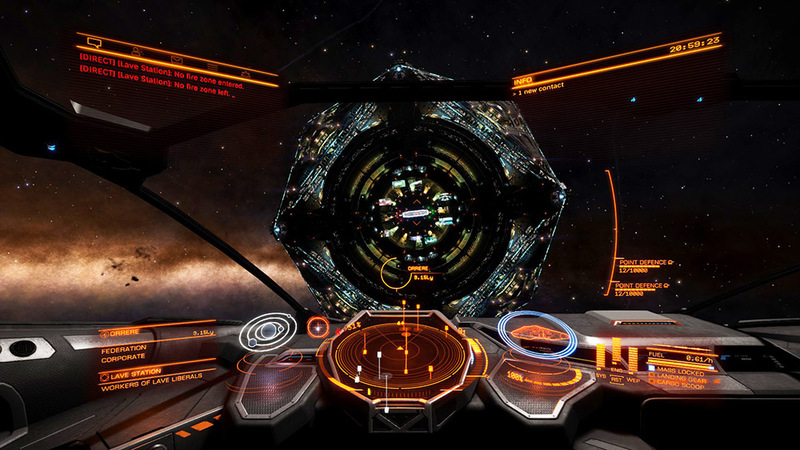 Let's have a look at Elite: Dangerous, an outer space flying-about game from Britain, of all places. It's the fourth in a long-running series of space simulator games that stretches all the way back to back to 1984. 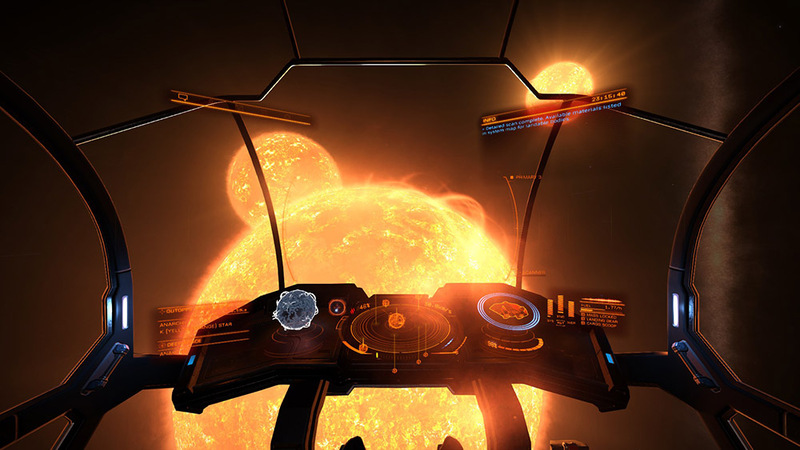 Elite: Dangerous was launched in December 2014, and has gone on to sell almost two million units. At a price of £19.99 for the base game it's five pounds more expensive than the original Elite. It is available for the PC, the Macintosh, and the Xbox. It's not bad but needs some work, 75% goodbye. A space station, one of many. Sanctuary from computer players at least. 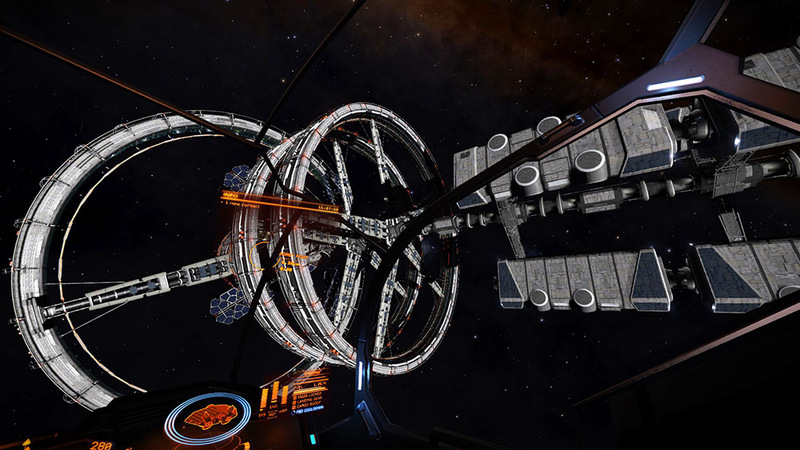 It is surprisingly easy to break one of the station's many rules, with potentially lethal consequences. Elite and its 1991 sequel Frontier were very popular in Europe, less so internationally; the series came to an end with 1995's First Encounters, which was released in an unfinished state by a publisher that was on the verge of bankruptcy. Twenty years and a popular Kickstarter campaign later the series is BACK!, albeit that for most of the people on the internet today it has never been away, because no-one outside the UK remembers it. "I'm the only one left alive", sang Scott Walker; he could have been singing about ED, because it's the only remaining A-list franchise from Britain's 8-bit 1980s, or at least the only one that isn't a nostalgic joke. In real life we only have a rough idea of the composition of a handful of nearby star systems. The majority of the Milky Way is a mystery to us. Elite: Dangerous tries to generate plausible star systems but occasionally goes awry, although in this case the results look fantastic. What is Elite? What are the Elite games? What are Elite? In brief, the games resemble Wing Commander minus the storyline, or Eve Online with an emphasis on combat rather than large-scale roleplay, or X-Wing but with freedom of movement, or No Man's Sky with a game. In the Elite series you are the pilot of a spaceship that you fly around the galaxy, shooting pirates and trading commodities and exploring and mining and ferrying passengers and upgrading your ship and buying a new ship and flying into and out of space stations and scooping fuel. You can't walk about or have a drink or anything, you're stuck in your chair. Elite: Dangerous takes place in the year 3300, where they have solved the problems of pooping and going to sleep. Earth, which is described as an Earth-Like World despite being the actual thing e.g. Earth, which it is (pictured). In the year 3300 Earth is a tourist destination and holiday home. The galaxy's corporations are instead based on Mars, which has been terraformed. The Elite games have always been drawn on an enormous canvas. The first game squeezed over two thousand star systems into less than 32kb of memory. Never mind that the systems all looked the same; it was the thought that counted. 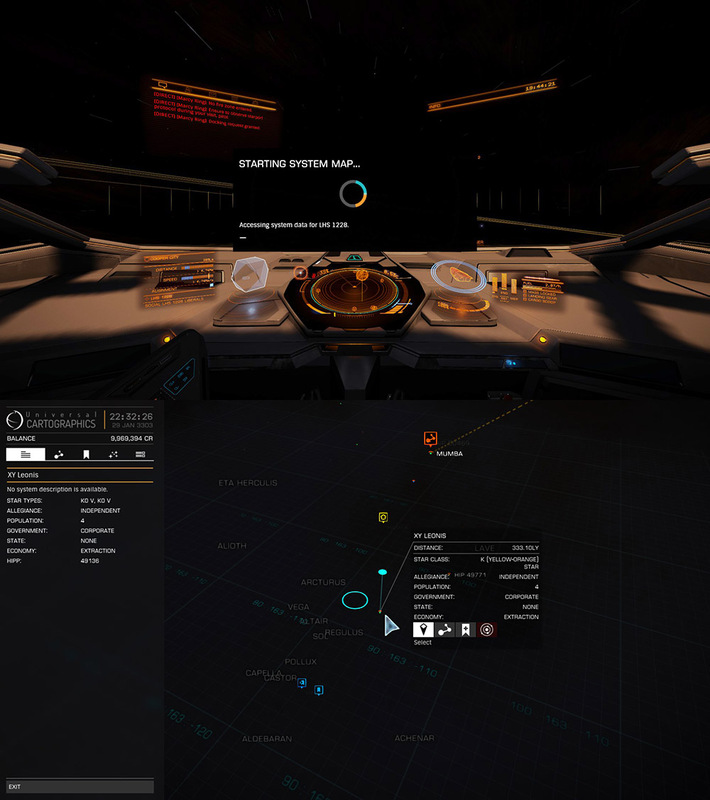 Elite: Dangerous takes place in a reasonably accurate simulation of the actual Milky Way galaxy, with over 400 billion star systems spanning tens of thousands of light years. To put that into perspective, if you tried to put 400 billion star systems into an Olympic-sized swimming pool, they wouldn't fit. The game's spaceships have jump ranges of around 16-25 light years and periodically require refuelling, so you haven't got a hope in hell of actually visiting the whole galaxy; even flying from one side of the Milky Way to the other is a major achievement that takes days of real time. Not all of the game's star systems can be visited yet - some are too far from a neighbouring star to reach - and the vast majority are boring, but only No Man's Sky is bigger. And even then the galaxy of No Man's Sky is an abstract thing, whereas Elite: Dangerous takes place in our Milky Way, the actual thing. The developers have even added the recently-discovered TRAPPIST system, and over time perhaps the game might evolve into a digital planetarium, a la Celestia. In a few years Elite: Dangerous might include a model of every building and human being on the Earth, including you and I, plus our computers, which will be running Elite: Dangerous, which will have a model of the entire universe, within which will be a model of ourselves playing Elite: Dangerous on simulations of computers that will in turn be running simulations of Elite: Dangerous. Goodbye, Boo the Magic Pirate. You couldn't run and you couldn't hide. The only thing I had in my hold was module reinforcement panels. And DEATH. At heart the original Elite was a 3D space combat game. The slick polygonal graphics and clever AI wowed players in 1984, but without depth it would have been a flash in the pan, like Starion. 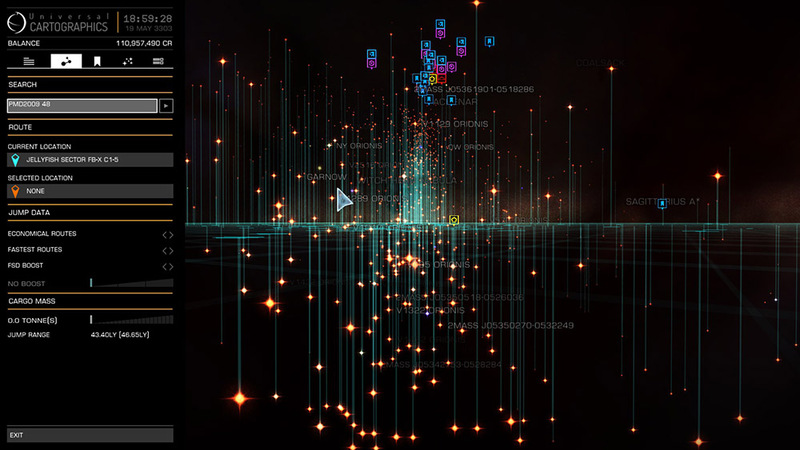 The developers added a simple text-based trading element and an unusually large star map, which gave the game an air of grandeur and purpose that set it apart from its peers. The cardboard box, poster, novella, advertising campaign etc sold the game as a premium product, giving the impression that Elite was a big deal, as indeed it was. Driving along in my automobile. Nobody beside me at the control yoke. The driving section is a bit like Lucasfilm Games' Koronis Rift; you gather minerals in a fractal landscape while under attack from flying saucers. Throughout the rest of the 1980s no other space trading game matched it; competitors such as Psi-5 Trading Company and Federation of Free Traders felt half-baked, and until the likes of Wing Commander: Privateer and Frontier in the 1990s there were no serious attempts to top it. The irony is that just as computing power advanced to a point where breathtaking outer-space graphics were commonplace the space combat genre died off. Conflict: Freespace and its sequel honed the genre to a peak of perfection just in time for it to be killed by the unstoppable juggernaut of the first-person shooter. Flight simulations hung on for a few years afterwards but even Microsoft's once-massive Flight Simulator came to an end, and the days when every PC gamer had a joystick and perhaps a throttle hidden in a cupboard somewhere are sadly long-gone. Elite: Dangerous is playable with a mouse and keyboard or an Xbox controller, but comes into its own with a joystick; I had one lying around from fifteen years ago. I was surprised to find that they still make joysticks. This is Wredguia SH-V d2-1. There are many star systems; this one has my name on it. Thrustmaster. There's a name. 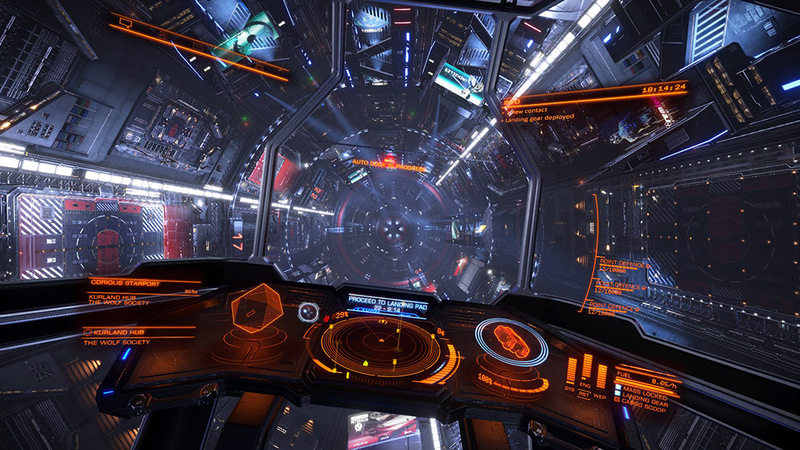 Elite: Dangerous begs for a joystick with lots of buttons, because it aims for a kind of invented verisimilitude. In the real future of the year 3300 space flight will be automated, but in Elite: Dangerous your ship has a tonne of controls. It's a bit like X-Wing, in that you have to balance power between your shields, thrusters, and weapons, and furthermore you have to navigate, speak with traffic control, operate the scoops, assign fire groups etc. 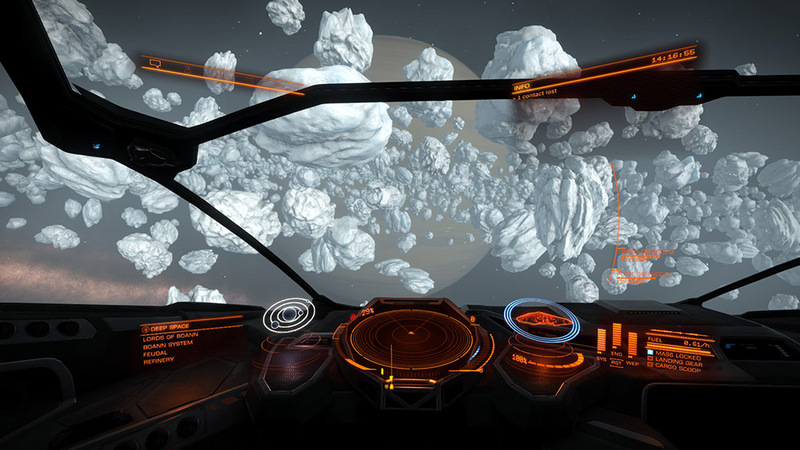 With a game like Elite: Dangerous the developers have to strike a balance between Top Trumps-style gameplay - where memorisation of arcane rules and the accumulation of top equipment wins the day - with pilot skill, which is a great leveller; as a player-vs-player game Elite: Dangerous leans in the former direction. You can play the game in "open" mode, which has a mixture of non-player spaceships and other human beings; you can also play it in "solo" mode, which only has non-player spaceships, albeit that you still have to be connected to the internet. You can swap between the two modes freely. The game runs in real time, which means that if you have twelve hours to complete a mission you really have twelve actual hours to complete a mission. You can't save the game; if you are blown up you are magically transported to the nearest space station, at which point your insurance lets you rebuy your ship for a reduced sum (and if you don't have enough money, you get the cheapest ship in the game for free). Is it any good? It's not bad. Really, it's a cut-down remake of Frontier with much better combat, with the cut-out bits held back for expansion packs. There's a tonne of grinding. It loses its spark after a while albeit that the combat is fun in short bursts. There's a peculiar deep-casual dichotomy, whereby the trading aspect requires an enormous commitment of time but, if you so choose, you can skip most of that and just have short bursts of combat. The game does a poor job of explaining the mechanics; you're expected to read up on that kind of thing externally. At top, the Eagle is a nifty light fighter that first appeared in Frontier. Daedalus Station orbiting Mercury has a 20% discount, so I picked one up as a runabout. At bottom the Anaconda is a veteran of the original Elite, where it was a large freighter. 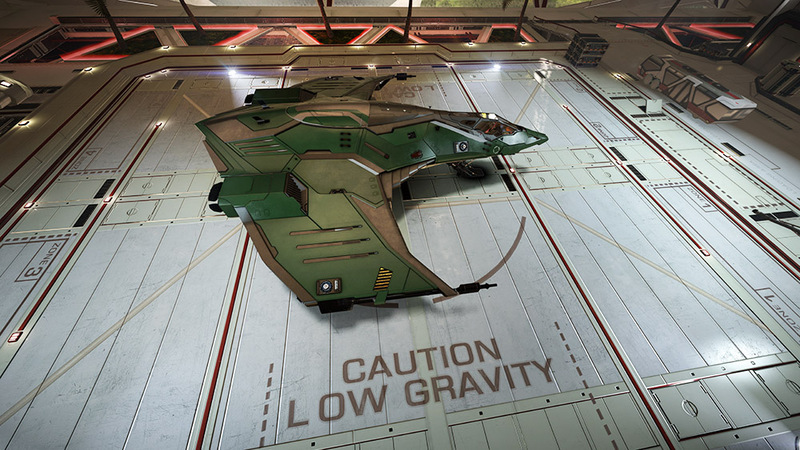 In Elite: Dangerous it is a versatile ship that carries a fearsome arsenal. At this point I'm going to digress a little bit, because the concept of meaningfulness is central to the appeal of the Elite games. People crave two things from video games. Firstly there is the visceral thrill of flashing lights and loud sounds. The earliest games had nothing else, they were just reaction tests. Twitch games, they were called. The continued popularity of roller coaster rides and alcohol demonstrate that human beings have not tired of cheap thrills, but some people want more than just a temporary buzz. Some people want to feel that their actions have meaning and that the world makes sense; that they are not just animals living meaningless lives on a planet that is doomed to die in a universe that is burning away its energy until all that will be left is a layer of heat and dust expanding into darkness, with no escape beyond the oblivion of drugs or dementia. Do you remember Simon, the old electronic game? It was an electronic toy that played a pattern of lights, and you had to match the pattern; over time the pattern grew more complicated. I like to think of Simon as a video game distilled to its barest essence, with a screen consisting of just four giant pixels. There is really no conceptual difference between Simon and Call of Duty 4. Both games involve looking at a pattern of lights on a display and then reacting to this pattern in such a way that the lights change in a pleasing way. We are all just sitting in front of a box of lights, pressing buttons so that the lights change in a way that pleases us. Some games are open about this; some games try to conceal it with meaning, because some people crave meaning. There is no-one behind the curtain, just an empty chair; and on the chair is a syringe of heroin to take away the fear and a revolver with which to blow out our brains. Do your drunk act, but hurry up - the mechanism does not know. One of the big home computer hits of 1979 was Star Raiders, developed by Doug Neubauer for Atari. The meat of Star Raiders was a space combat engine that used scaled sprites to create a 3D effect, but Neubauer reasoned that endless combat would be boring, so he added a subgame whereby the player had to travel between star systems, chasing after the Zylon baddies before they could destroy the player's space station. By modern standards the game is very simple, but in 1979 it was like being fucked in the eyeballs by God. I remember playing it on the Atari 2600 and feeling as if there was a whole universe inside the machine. I used to enjoy the smell of car exhausts and I once attacked a cat with a fork. Star Raiders was an upgrade of the older, minicomputer-era Star Trek games, which had a text-based interface. In Star Trek games the player entered commands via the keyboard rather than using a joystick. With Star Raiders the basic idea mutated towards fast-paced space combat rather than naval-style torpedo salvos, but the Star Trek concept mutated in another direction as well, picking up elements of trading games. I can't find a definitive history of trading games anywhere, but they have been around since the beginning of time. The 1973 classic 101 BASIC Computer Games (a book) includes STOCK, a stock market simulation, and FURS, a fur trading game in which you have to "trade furs with the white man". On a fundamental level trading games consist of typing numbers into a computer so that the numbers go up, which you can also do just by entering numbers into a calculator and hitting the plus key a lot, but crucially in the context of a game the numbers have meaning, and that pleases some people, even though the numbers don't really have meaning. You can't eat numbers, for example. You can't go out into space with fractions. What if God is an equation, and it's not our universe at all? What if we're just a side-effect? One day he will turn off the experiment and we will be gone, just like that. 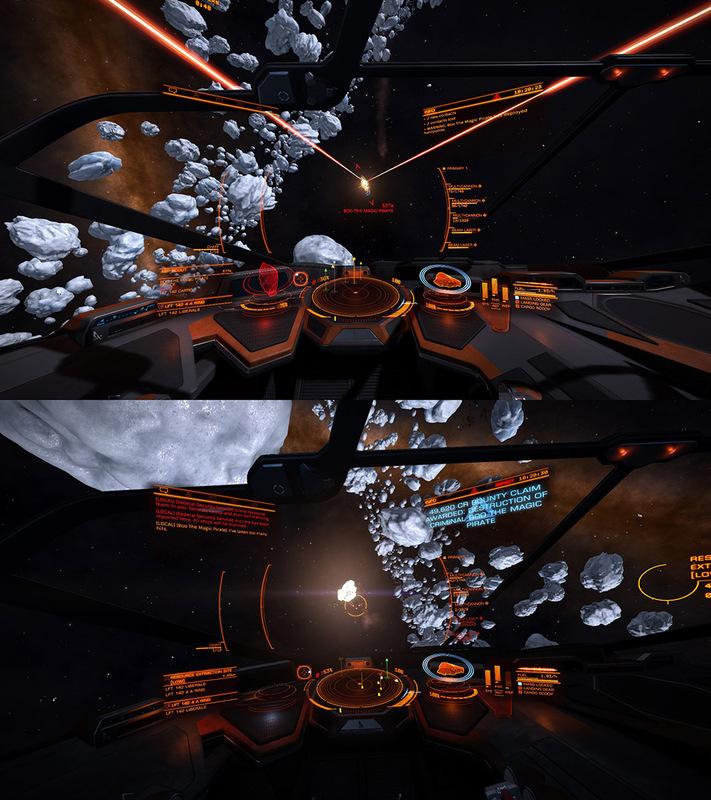 Elite combined the combat of Star Raiders with the trading of trading games. It was one of the giants of the 8-bit era in the United Kingdom. Beyond the slick 3D graphics and clever details its success boiled down to the fact that it felt meaningful. The trading aspect was perfunctory, the procedurally-generated planets all looked the same, the gameplay was extraordinarily repetitive, but it really felt as if you were flying your own spaceship in a futuristic galaxy, master of your fate and captain of your soul. 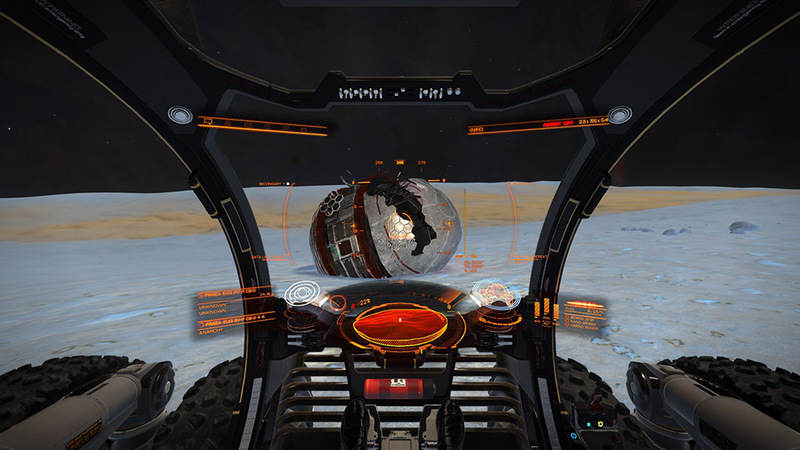 Elite took place in a galaxy where piracy was commonplace and life was cheap. You could choose to trade illegal drugs or slaves; you could destroy passing freighters and steal their cargo. The police would attack you but the game did not punish you otherwise for being bad; the game had no moral imperative for the player to be good. It took place in a universe where there was no good or bad, only numbers, an environment incompatible with the notion of heroism. Imagine a universe in which there is no good or bad, just actors acting according to their interests. No-one to live or die for. Above us, only sky. Elite was developed by a team of just two people, David Braben and a second person. Braben was nineteen when he developed the game, but he looked much older, with the result that he doesn't appear to have aged at the same rate as everybody else. He is now David Braben OBE. For Elite's sequel, Frontier, he famously programmed the game engine in 68000 assembly language by himself using only his thumbs; as far as I can tell he doesn't have the same kind of hands-on involvement in development any more and is essentially Elite: Dangerous' constitutional monarch. He delivers talks and sells the game to the public. There's something quite melancholic about the Elite games from a British perspective. The internet is a white American teenage-twentysomething boy. The likes of Reddit, Imgur, Buzzfeed and so forth are exclusively written for an audience of white American teenagers, and none of them have heard of David Braben. 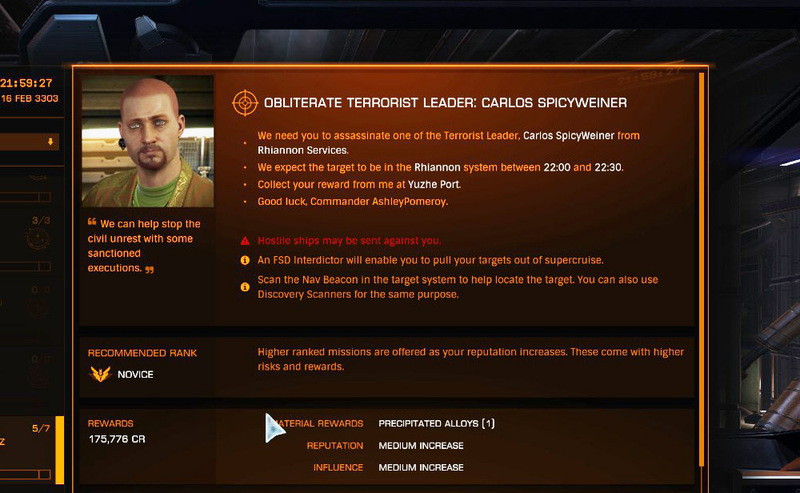 The vast majority of the people in the Elite: Dangerous subreddit haven't heard of him, or of Elite. For them David Braben is just this guy, you know, and Elite: Dangerous is an entirely new game. Except that it's not, really. It's basically a remake of Frontier, which came out in 1991. Elite was a space combat simulation with space accoutrements. Frontier embellished the accoutrements but sadly screwed up the space combat. Instead of having a simple flight model with the spaceships swooping and diving like X-Wings, David Braben decided to give Frontier accurate physics, with the result that Frontier's combat was a lot of high-speed jousting passes and the space flight was an automated process that the player was better off skipping with time advance. The result was a sequel that felt like a technical exercise more than a game - a Star Trek space trader with a skippable graphical shell. With clever use of compression and procedural generation Braben managed to squeeze a tonne of content into Frontier, but it was boring to play. 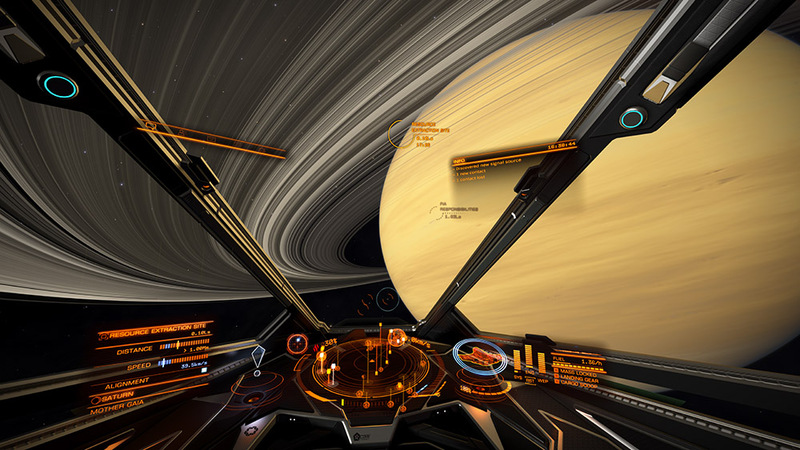 In some respects Elite: Dangerous is less ambitious than its ancestor. 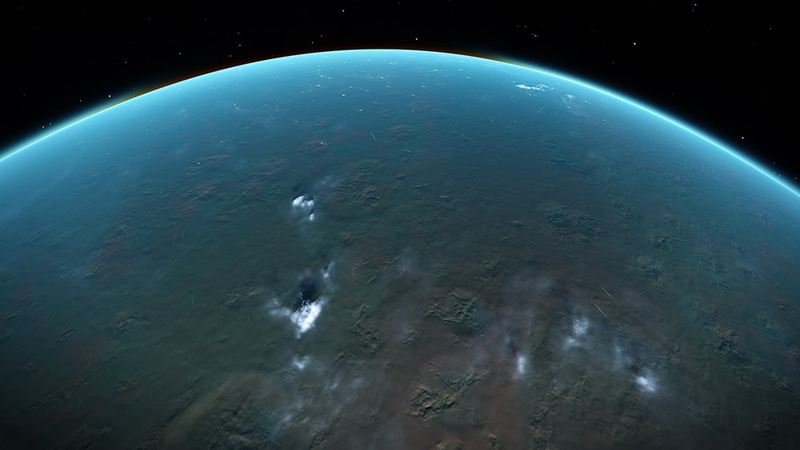 In Frontier you could take off from a planet's surface, fly into space, warp to another star system, and fly down to a planet all in one fluid motion, right from the start of the game. Elite: Dangerous doesn't have that. The Horizons expansion pack allows you to land on rocky moons, but not atmospheric bodies, which means that you can't land on Earth for example. Elite: Dangerous has a wide range of ships, but Frontier had more; furthermore Frontier's ships came in a wider variety of sizes, whereas Elite: Dangerous doesn't have any truly huge player-flown vessels. Some of Frontier's ships required extra crew, which is something the developers of Elite: Dangerous are still working on. I haven't talked about the graphics and sound, have I? 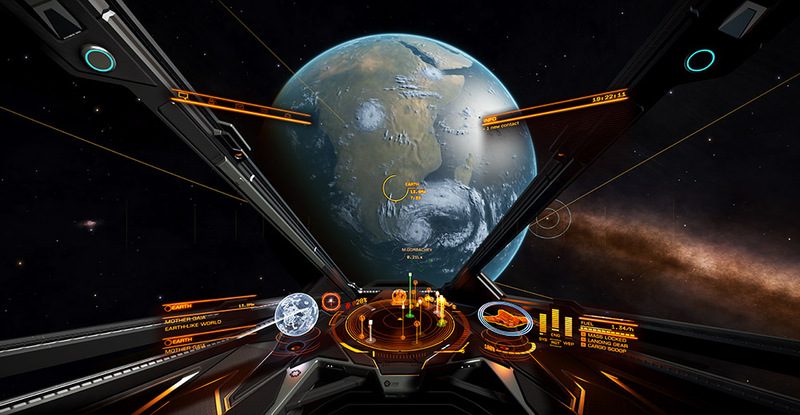 Elite: Dangerous has a clean, slightly plastic graphic style; the space visuals are functional but the game doesn't have a distinctive visual language, unlike for example The Long Dark or Pulsar: Lost Colony. The sound design is however terrific. Each of the spaceships has a distinctive aural signature. The police Viper makes a throaty roar that smells of petrol, the Asp Explorer sounds like a propellor plane, the cockpits creak when you apply boost as if they were wooden ships. Even planets and empty space have a distinctive noise. The soundtrack is low-key but effective and the game even plays The Blue Danube when you turn on the docking computer. What little voice acting the game has is decent, although I have the impression they only had two voice actors, a man and a woman. The NPCs have pictures; in Frontier the NPCs looked like plastic dolls wearing stupid hats, in Elite: Dangerous they look like extras from an Albert Pyun film. As with Frontier the non-Caucasian characters are just Caucasians with a different colour palette, which looks odd. 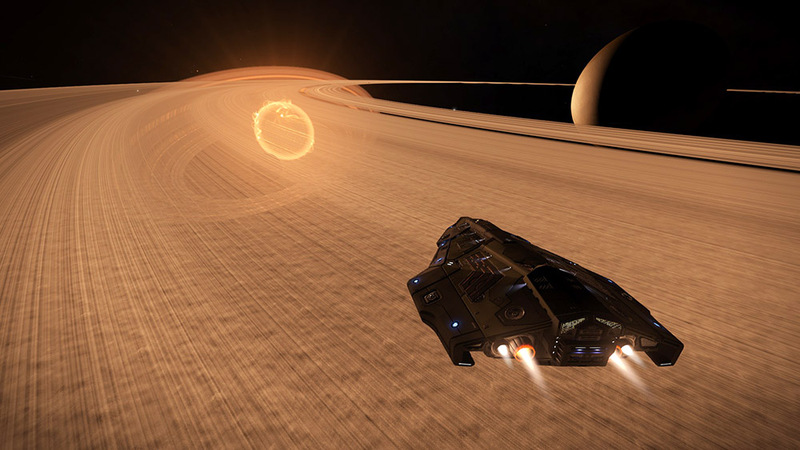 Elite: Dangerous suffers from forced attempts to make simple things feel meaningful. In the original, mining was a simple matter of shooting asteroids and collecting the fragments. You needed a special laser and a cargo scoop, but the special laser did double-duty as the best weapon in the game - it had a slow rate of fire but was very powerful - and the cargo scoop could also be used to gather fuel. 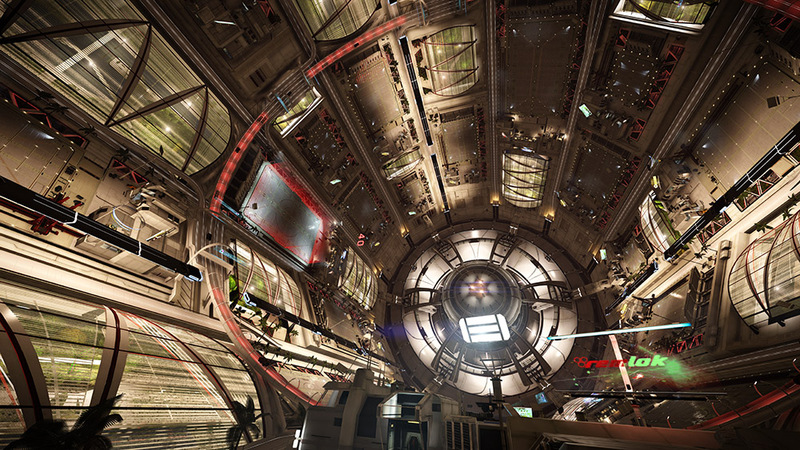 In Elite: Dangerous the process is much more complicated. You have to shoot asteroids until fragments break off, at which point you collect the fragments, either manually or with special drones. The fragments are deposited into your refinery, which has a number of hoppers. Each fragment has a certain percentage of valuable metal or superfluous space rock, and when you have collected enough fragments to make a tonne of sellable cargo it is deposited in your hold. However each hopper can only store one type of material, so if you collect more types of material than you have free hoppers you have to jettison the excess. There is a second type of special drone that boosts the output of an asteroid, and you can only carry a certain amount of drones. Mining feels complicated in an arbitrary way, and in my experience it's just not worth the hassle. The galaxy map is fiddly but you get the hang of it, although it still needs work. The transitions between the map and normal space are crude. While I'm picking holes, the 32-bit version of the game feels stable but the 64-bit version hangs frequently. Exploration suffers from a similar attempt to make a simple process more complicated and thus more meaningful. 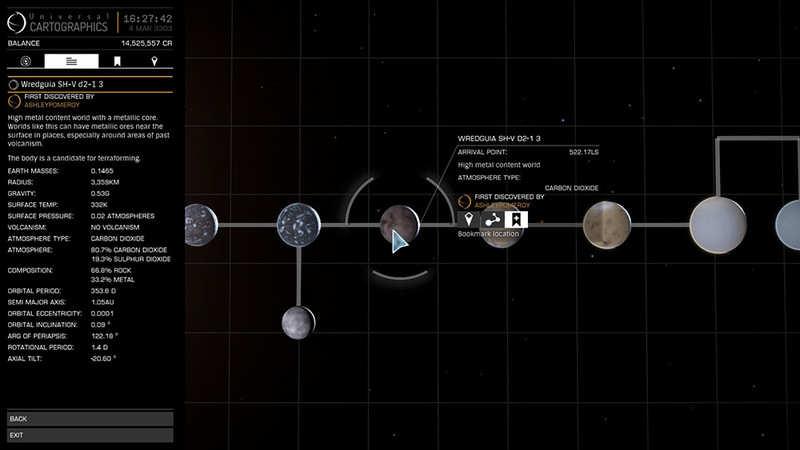 When you encounter a planet for the first time you can scan it for a small reward; if you venture out into the galaxy you can encounter planets that no-one else has scanned, in which case the game records your name against it. It's not enough just to encounter the planet, however, you have to scan it with a special device which takes up one of your spaceship's utility slots. It's less fiddly than mining but it still feels like unnecessary complication. Along similar lines the situation with bounties includes a confusing system of timers, legacy fines, and dormant bounties, which adds nothing to the gameplay except confusion, misery, heartache, wrath, tears, hatred, lingering scars, and painful sores. Passenger-ferrying missions are relatively straightforward - you buy a passenger compartment and then fly the passenger where they want to go - but are buggy, occasionally failing immediately but leaving you with passengers that you can't get rid of without removing modules from your ship. Off the top of my head Frontier had a similar bug, which makes me wonder if Elite: Dangerous reuses some of Frontier's code (surely not). While I'm in a grouchy mood, the transitions between spaceflight and the star map feel unpolished; the decision to put so many star bases near the other star in a binary star system, thus forcing the player to fly for ten minutes or more - over an hour, in the case of Proxima Centauri - was a bad decision; in fact the game goes out of its way to be frustrating at times, forcing the player to fly around suns and space stations in order to reach the destination. Ultimately the biggest problem is the grinding nature of the game. The only real gameplay goals are visiting interesting systems and building up your spaceship, but there are only a limited quantity of each, and in order to upgrade your ship you have to carry freight or special cargo back and forth for literally days before you can afford things. 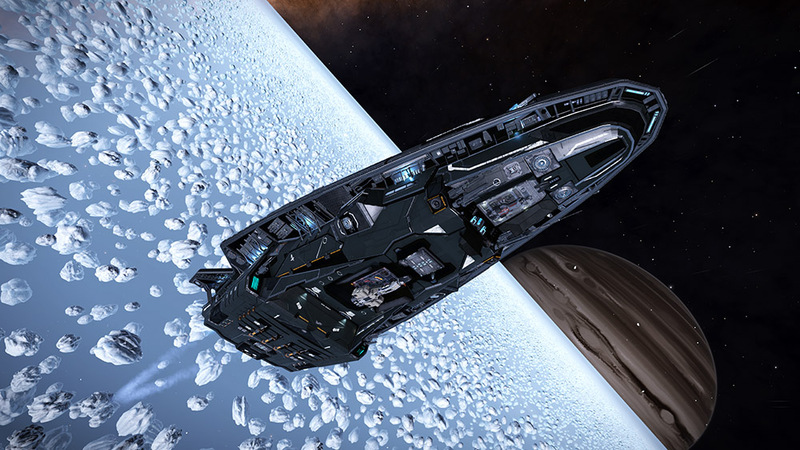 As a veteran of the original Elite and of Frontier as well I have a head start over new players, but even so it took a couple of weeks of playing before I could afford to kit out the Anaconda featured in some of these screenshots to an acceptable level of performance. One of the aims of the Chinese Cultural Revolution was the destruction of the four "olds". Old customs, old culture, old habits, old ideas. This was necessary for China to advance, and nowadays China is the world's leading economy. The high-rise cities of modern China look nothing like China of just twenty years ago. For the most part the changes have been positive, and if the buildings have to be torn down and remade every few years, what does it matter? An economy is a living thing, not a fossil. Elite had the tedious grind of trading so that the game would not feel insubstantial, but that was 1984. The developers had no other options and expectations were lower. Massively multiplayer games still have grinding, but they also have team interaction and trophies and collectables and subgames and so forth to make the grinding less onerous. 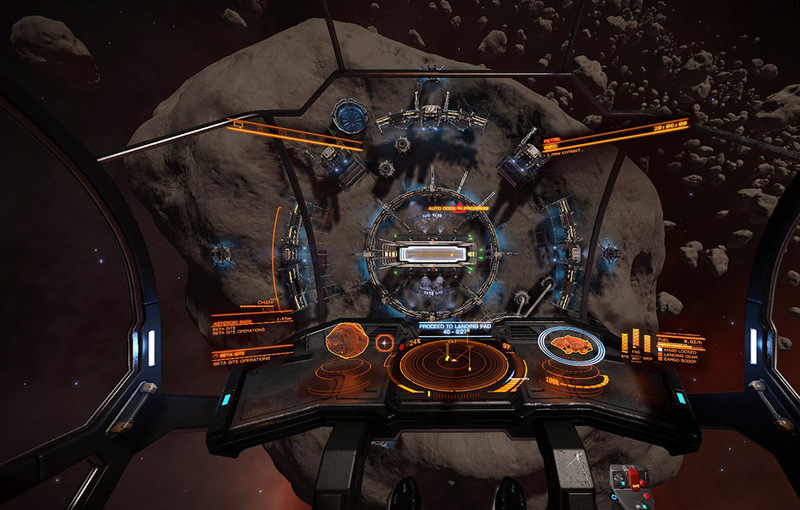 Elite: Dangerous doesn't have that yet. It feels like a terrific single-player game from the pre-internet era beamed into the modern age. The ships divide into three strands. Some are general-purpose; some are traders; some are fighters. 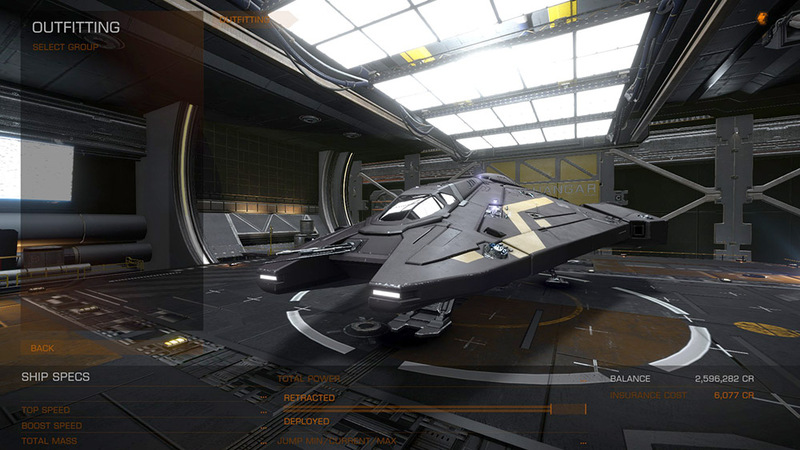 The Vulture is a dedicated combat ship, one of the best in game, perhaps the best in terms of expenditure-to-results. Furthermore it lacks imagination. Beyond trading there are quests, but they essentially consist of ferrying objects or data from one place to another, or blowing up certain ships, or collecting canisters. It adds nothing substantial to the gameplay of Frontier. It would be nice to participate in large-scale assaults on space stations, for example, or save colonists from asteroid bombardment, or build your own personal prefabricated hangar on an alien world - or even lay claim to one of the billions of planets or moons in the galaxy and fund a space station or city - or have battles inside enormous alien structures, or race through dense planetary rings as part of a series of challenges, etc etc. Beyond the idea of setting most of the combat inside planetary rings - which solves the problem of space combat being a lot of tight turns in empty space - Elite: Dangerous feels devoid of genuine innovation, as if the developers had been given the brief of translating Frontier as best they could, without adding anything. In some respect the developers have embraced current trends. Elite: Dangerous has a number of DLC options, which range from the ridiculous (£5 for a custom paint job, £7 for a cosmetic set of go-faster spoilers) to the iffy-but-probably-necessary (£19.99 for Horizons, which is a mass of patches). But flying through even the popular parts of space feels very lonely, and beyond interdicting and shooting down other players there is very little opportunity for interaction or teamwork. There is a multiplayer-only close quarters arena, but it's not popular enough to sustain an infrastructure, and unlike Unreal Tournament and its peers the space combat of Elite: Dangerous isn't viscerally exciting enough to compensate for the lack of meaning when shorn of the trading and exploration. In summary Elite: Dangerous is a terrific translation of Frontier that fixes that game's dreadful space combat, but adds very little of genuine substance, which is disappointing given that Frontier is a quarter of a century old. On the one hand Elite: Dangerous has a modest budget and a very small development team, and on the same hand it is still in development, but on the other hand what if the upcoming Star Citizen is more engaging? Elite has a certain amount of nostalgia appeal for a tiny number of ageing British people, but that's not enough to fund an A-list title. It will be interesting to see how things pan out.